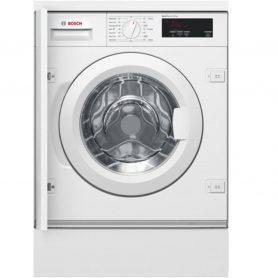 With an impressive A+++ energy efficiency rating and time-saving features, the Bosch WIW28300GB is perfect for busy, energy-conscious households. It also comes in a classic white, so is sure to suit any home’s kitchen space. Bosch knows that every day is different, and that includes doing the laundry. That’s where VarioPerfect comes in handy, which allows you to choose between saving time or energy. If you’re not in a rush, select EcoPerfect and reduce power consumption by up to 30%. Or, when you need your clothes in a hurry, choose SpeedPerfect to reduce laundry time by up to 55%. The built-in WIW28300GB comes with 8 kg of capacity and a choice of 15 programmes to suit your load – whatever the colour or fabric. As cottons are often the most used fabric, Bosch has given this machine seven tailored cotton cycles. These cycles are based on temperature, so there’s no need to tinker with the settings to suit your cotton load. 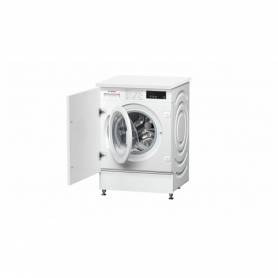 Other specialist programmes include wool, delicates and mixed load – these adjust the wash settings automatically, so you can rest assured that clothes are cleaned without any harsh treatment. In addition, a safeguard monitoring system adjusts the load distribution and programme settings to protect your clothes. Want to take advantage of lower electricity rates, but don’t want to be kept awake? Then not to worry – the Night Wash programme uses slower spin speeds to keep noise to a minimum, letting you sleep peacefully while your cycle runs. After selecting your programme, use the large display with touch controls to adjust the spin speed and finish time, or set a time delay. Give your clothes the TLC they deserve with the WaveDrum. This drum has a unique structure and asymmetrical paddles, which can be gentler or harder on your clothes, depending on the fabric. WaveDrum also ensures even detergent distribution and a more constant water flow. 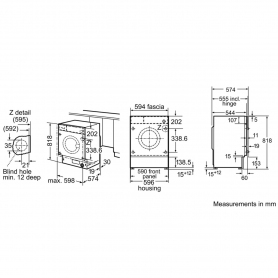 The EcoSilence Drive brushless motor also keeps the WIW28300GB at a super quiet 41 dB during the wash cycle – that’s about the same level as a quiet library. And, in the unlikely event of a problem with the machine, you won’t need to worry about any leaks. 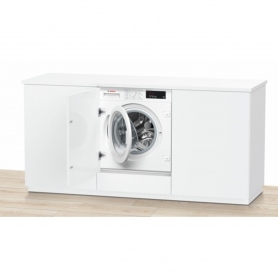 This Bosch washing machine comes with AquaStop, which gives extra protection against flooding. If you want to add or remove items once the programme has started, take advantage of the handy ReLoad function. Plus, the whole door opens while you pause the programme, so you aren’t restricted by the clothing’s size – whether that’s a stray sock or pair of jeans. 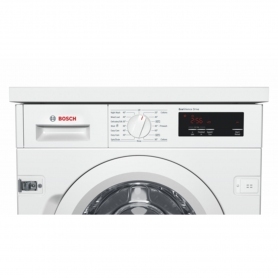 The Bosch WIW28300GB is a highly efficient, built-in washing machine that can save you time and money – buy yours today.